Our WeAllSew team – Alice, Erika and Jo – share what’s at the top of their holiday sewing wish lists! What’s on your holiday wish list this year? Share a comment with us including what you want for your sewing corner this holiday season and enter for a chance to win a BERNINA tote bag with some of our favorite BERNINA goodies inside, a $50 value*! Comments are open for the contest until Thursday November 29 at Midnight CST, and we’ll announce the winner right here. Read on to find out what Alice, Erika and Jo have picked as their top “must-have-to-sew” gifts this year. #1. After my embroidered wedding favor debut I’d love to step up my sewing journey and delve into the world of embroidery with the BERNINA B 580. #2. The BERNINA Walking Foot #50 is a great tool, and it’s not just for quilters. This is also a very practical tool for craft projects, like the neck pillow project I’d like to tackle which has lots of curves. #3. I’d love a pair of Gingher embroidery scissors. These high quality scissors (and stylish, too!) make the job of trimming so much easier. I have got to get rid of my old dull scissors! #1. Now that I’ve started quilting my top gift pick is the BERNINA 750 QE. All that extra space means an easier time getting larger quilts in the machine, and with that big, beautuful bobbin I’ll be stitching forever before having to stop and refill. #2. 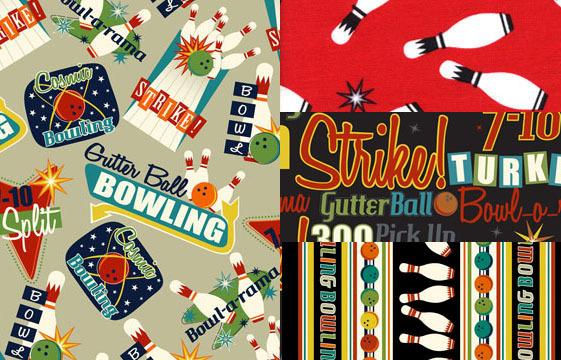 I would love one yard of each and every print from the “It’s A Strike” fabric line from Benartex fabrics. Don’t ask me what I’m going to make with it, I just HAVE to have it! #3. I’d like to learn more about some quilting techniques, like how to hone my free-motion quilting skills. And I always jump at the chance to learn how to make a new project , I love sewing with others! A gift certificate to my local BERNINA Dealer store will do the trick, they have lots of classes, and I can find thier upcoming class listing right online. #1. I’ve had my eye on the TrueCut Cutting and Crafting table by The Grace Company. Even when the table is fully open, it’s small enough to fit in my tiny sewing room! The two big shelves are great for holding bins and boxes of sewing supplies. #2. I’d love a Tutto Serger Bag. Do you see all those straps and pockets? 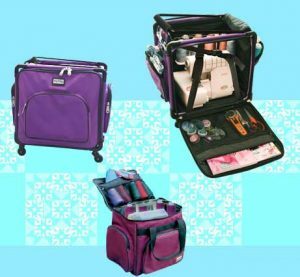 Plenty of space for thread and fabric, and the wheels and handle make it easy to tote to classes. #3. 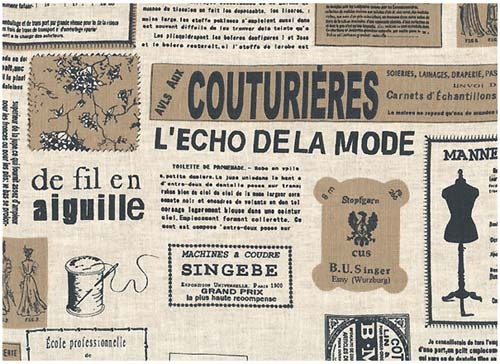 I want some linen coordinates from Stof’s La Couture Collection to reupholster my office chair and make some new accessories for my office and sewing rooms. *Winner selected by random from comments. Only one comment per person. Contest open to US residents only. Thank you ALL who entered our contest by leaving a comment, and you all have some great gift suggestions. Congratulations to our contest winner, WeAllSew member “trekmom” who’s comment was chosen at random! I am hoping for more fabric, of course! I would love a Bernina, too! My wife has just recently brought me to dark side of quilting, she taught me how to quilt. It really has helped me in relaxing from the every day issues. I even purchased my first Bernina, it’s been a great year! We even started going to our local quilt store for classes, it’s been great meeting new people that vary in ages. I would love to get a Bernina Foot 57 and money to start my statch. I also would love to see your sight publish more tutorials on raw edge quilts! I still haven’t found a good tutorial on this technic. Good Luck to all! A Bernina 780 and new scissors! wishing for anything related to sewing/quilting. Fabric stores are my second home. FYI: Proud owner of Bernina 820 and 260. Love them! I agree, you can’t have enough fabric but I would also like a spool holder for my Bernina. I would love an embroidery machine. I see the lovey things created by others on their embroidery machines and long for one. I love to sew for my home and for others. There seems to be an epidemic *smile* of new babies in our church and I think of the lovely keepsake gifts I would love to give each one. It would also be wonderful to find a walking foot for my old work horse Bernina 830. By the way, it still works like a charm! I have located a couple on e-bay, but the price was more than I can manage. Also contacted Bernina, but they were unable to help. I would like more cabinet space to store fabric. Does one ever have enough? A new Bernina would be the icing on the cake! Shelves for my fabric closet is on my list this year. I really need a new sewing machine which sews leather easily. Of course, I would also like quality leathers and fabrics. I would LOVE to have lots of embroidery thread to go with my new 780!! This is my first machine that does embroidery and my family and friends already have lots of projects for me to do. wishing for studio suite I really like paint works, but wouldn’t mind crystal works and cutworks as well. I would love a new bernina sewing and embroidery machine, and of course more fabric. I am hoping for gift certificates to my favourite local quilt shop so that I can buy some fabulous fabric, feet, notions! Because I am also a seasoned sewist who has recently discovered and love quilting, I would love to have the Bernina 750 QE! I would like a tutto case for my embroidery module, curved snips, better storage for my embroidery supplies, and more time to sew! Wow! A Wish List for me –Top would be a Bernina 750 or 830. 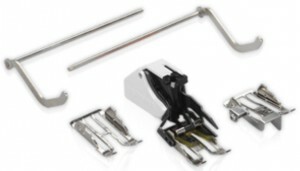 Next in line are the accessory feet for my Bernina 1300 mdc that I don’t already have. Also the Needle Punch Tool and Stitch plate for my Bernina 380. I think the Spanish hem tool set would be a nice thing in my stocking too. And last but not least on this spur of the moment list would be a dvd/cd with downloads showing how to use my accessories and feet for my various Bernina machines! I live in a place with challenges internet connection so having a dvd would really be helpful at three a.m. when my local dealer isn’t available to help me figure out a technique! My Feetures Books are helpful but a dvd would be a nice addition. Since we are in the process of moving, my sweet B 830 and entire sewing room have been packed since mid August. What I want for Christmas is to be able to unpack into my new sewing room & get on with making things. Of course I could use that Serger bag & the cutting table, but they’re pretty far down my list. Please, Santa, just let me get back to sewing! Love my Bernina QE aurora 440. Quilting is so addicting! Always need fabric, but have a love of notions too. My “B” is little but she can pump out beautiful stuff! As my grandkids get older, I want to be able to covert fabric scraps into doll clothes. My wish is for a serger and and of course, cones of thread. I want the BERNINA Designworks Suite. I use my sewing machine to add an extra dimension to my scrapbooking, and I can see so many ways for this to be useful! A dress form is at the top of my wish list, followed by a long list of Bernina specialty feet. And, of course, a personal assistant to keep my sewing space neat and tidy! I love, love, love that linen! I see a makeover for my very comfortable but very ugly sewing chair after the first of the year. Thanks for the inspiration! Classes. A change to take a trip to sew and learn with others. Fun. My Bernina is the first thing I would save should there ever be a housefire! Sewing on it is a reason to get out of bed, even on a bad day, and I Love the comments I always receive whenever I show off a new outfit, or bed quilt, or embellished wall hanging. I’m a long-time user and devotee of anything “Bernina”. I would love a Sew Steady Table for my Bernina 580. I have a craft table but a more stable one would complement my work space and my ability to easily complete projects. While a Bernina 750 QE would be a dream gift it’s not in the cards I know! 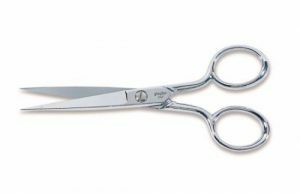 But hoepfully some nice super sharp Elan scissors will be! I’d also love some new gadgets or Aurifil thread sets! I am hoping for an 830, but I guess I will be hoping a while longer. I would love to have the BERNINA Designworks Suite or the Designer Plus software. I’m waiting for my 750qe to be delivered right now, and having the software to fully utilize its potential would be awesome! I would love to learn more about garment sewing so books or classes (or both!) are on my list. I would love a new Bernina, perhaps a 750 or 830? I would love to own the 750QE and the new Design Works, and more colors of Isacord, and, and, and. I would love to own the 750QE and the new Design Works, and more colors of Isacord, and, and, and. I love my Berninas, the 1530, 440QE, Deco, and serger! Designworks – that cut out too is amazing. Oh I have my eye on the 780! And a bernina serger ;). I’d also love more fabric however more time and organized sewing area are more top priority. Maybe some gift certificates to my local dealer for classes :). I would love to own a Bernina 830 and sew like a professional. Taking Bernina’s sewing classes and learning more advance techhniques. My dream is to have a Bernina sewing machine, to make beautiful clothing, quilts, embroider custom items and to be featured as fashion designer in a magazine with my Bernina 830. I already have a Bernina 820 and just bought a 530 so what else could I want? More bobbins for the 820 are always good! I just got the new Bernina 750, so now I’d love a new Koala sewing cabinet to put it in! And I always want more thread and fabric of all kinds. Fabric, lots of it! But really, I need a cutting table bad. My family doesn’t even get to use our dining room table sometimes. I would love to get a chance to go to the classes they offer to learn my digitizing software so that I can actually use it!! And of course some fabric and more thread colors! Six months ago I bought the Artista 635 Bernina Embroidery machine. I taught Family Consumer Science for 30 years and two years ago retired and owning this Machine has re-enlightened my talents. I recycle Kiteboarding Kites into Custom bags, http://www.nicetimebags.com and just started making family members Quilts. My Christmas list would include the Bernina Walking Foot which I know now is needed for making quilts and an assortment of Isacord Embroidery Thread. I would love gift card from some of my favorite quilt shop. I am very blessed because my Mom gave me a Bernina 830. What more could a girl want. Love my 730! On my Christmas wish list is a cutting table that is height adjustable. The latest version of Bernina Embroidery software is tops on my list! I want the new design works and I would love to have the quilting frames!!!!!!!!!! AND I LOVE MY 830! EVERYONE SHOULD OWN ONE!!!!!!!!!!!!!!!!!!!!!!!!!!!!!!!! I would love perpetual daylight for my sewing room! I would love a Bernina 830 first off. Then lots of Aurilfil thread for quilting. And lots of Robison Anton thread for embroidery. I have plenty of fabric! Oh, and 45mm blades & Schmetz 90/14 Topsitich needles. I would be all set with these. I would love the new paintworks software. I purchased the cutworks on its own when it first came out. I absolutely LOVE my new Bernina 830 and the limitless creativity it inspires. I’ve had several other brand machines, and the advertisement is so true – “Nothing sews like a Bernina”! I’d love a new cabinet to house my fabulous 830LE plus a new sewing chair. Then throw in the Artistic software suite with Cameo cutter and crystal starter set. Would love to have Crystal works as well. Of course tops on my wish list is the new 780. But what I really, really need is a new accessory box. I broke the door on the one that came with my 440, plus I don’t have room for all my feet. I’m making placemat, runner, napkin sets for my friends and family. I am using the same pattern for all but using fabrics that reflect the interests of the recipients. I would love a newer Bernina that does embroidery!! would love to have a new sewing cabinet for my 830…need more space in the sewing room so that new cutting/craft table would sure be great. And would really like receiving that bag of goodies in this giveaway! Love my BERNINA SEWING MACHINES!! My wish is for a reorganized sewing room with new sewing machine cabinet with a flip up surface to allow quilting projects and a new Bernina machine I could use for quilting, large embroidery, and regular sewing projects. I hope Santa is reading all our comments. Thank you, Santa. I’ll leave you some cookies and milk. I would love to have some new feet for using on my Bernina. And the time to play with them of course! If money were no object, I would love the latest Bernina sewing/embroidery machine. In real life, though, I would love a walking foot for my 185E Artista machine. Actually, any attachment for that machine! Anything Bernina is great! Well…except for the chap stick that I got as a class door prize ; ). I still use my 1970’s Bernina 830. I would love to upgrade to the 780e so I could add embroidery. I have two grandsons coming! I would love some new scissors. My best friend gave me an embroidery machine to make pretties for my first grandchild due in January (a girl!). Now I just need some classes to learn how to use the machine to its full potential. Know that feeling! So much to learn that a book just can’t show you! I would LOVE to have a Bernina 830. I have a 580 & didn’t realize how much more I could do with the 830 like automatic needle threader! I’d LOVE to get a Bernina 830 or 780—but I haven’t been THAT good! Maybe I’ve been good enough this year to receive a Bernina Stitch Regulator for my 580. I do love my 580!!! I would like a sew easy table with the plain insert and the lightbox insert for my 830, I will be traveling in my RV and need the table so i can continue using my new and fabulous machine. I would love to upgrade my embroidery software. I have been collecting project ideas and now I need to start making them! Love the ideas that Bernina offers on their website. I would love to have the cutwork and the felting tools! I’d like a rolling bag for my smaller machine, a B630, since I take it monthly to charity sewing meetings. And I’d like to be able to take a software seminar close to home. But more time to explore the capabilities of my 6 month old B830 LE is always a wish!! I just purchased the 780.. and am so excited for it to arrive this week. Have loved all the bernina products and have sewn on Bernina since 1980. This year I would like to add to my wish list, the extra large hoop for embroidering on the 780, the design works suite, a red bernina sewing chair and the quilting frame. LOVE Bernina!!! I just got my first Bernina in September so I am slowly building my foot collection. My new must have foot is the Walking Foot…it is at the top of my Christmas List. I would love a nice and sturdy cutting and storage table. I already have a Bernina sewing machine I love. A Bernina serger would be great also. I’m looking forward to a front facing light for my machine. Given up of 25 hrs a day or 8 days a week! I really need more feet for my bernina 635, especially the walking foot!!! I would like a Bernina that sews a perfect straight line….My 440QE stitches look like a hand sewn stem stitch…zigging slightly to the side. I would love for my sewing space to be a little more ergonomic and to spend more time on my projects! I have a new Bernina 550QE, a new sewing table/cabinet, piles and piles of fabric and a patient and encouraging husband. What I really need is the eyesight I had 35 years ago. That’s what I really wish for. I would love to have a bernina quilt frame and a designated sewing machine to live on it so that I would not have to move my 830LE on and off of it, I would also love to add to my collection of sewing machine feet and other accessories such as software to enable more creativity. I’m a fabric lover and collector. My wish list is a Bernina 830. Also love the free motion couching foot. And you can never have enough fabric. I have two Berninas and I want to had a couple of feet I don’t have. I need new scissors, but mostly I just need time and energy to get my projects finished! Fabric, Fabric and more Fabric. I have all the cool Bernina tools a girl could want!! Now I just need fabric and of course thread, but mostly FABRIC!!!! I know my Bernina 830 would love to have the quilt frame as a companion. I just need more time in a day! I would love a new Bernina 830E with all the bells and whistles. Might as well dream big! That way I could pass my trusty Bernina 180E down to my young adult granddaughter, a very creative aspiring seamstress. My dream is to have a dedicated sewing room so anything for a sewing room would be wonderful. I especially would like a laptop to use with my machine when I embroider. I am having a great time with my Bernina 440QE and would like to learn to do more with it. I would like to take more classes and a laptop would make that possible. I have 3 old Berninas that are my prize possessions. Someday, I’d like a new computerized one, though. I’m longing for all of Barbara Brackman’s William Morris fabrics, from the hard to find old ones to the new collection. I would love anything for my Bernina!!! A new Bernina sewing machine with embroidery capabilities and extra accessories would be at the top of my wish list. I am a long-time user of Bernina products and think they are the best. Would love a Bernina that does it all – is that the 830? And of course a great cabinet for it and all the rest of the goodies for a real sewing studio. Go ahead, turn the bedroom into sewing space. I’ll sleep on the sofa. Now that I own Bernina 830 my wish for holidays is to get designer plus software. I am enjoying my machine very much. My children says it feels like they have a new sibling. I would love the Designer Software! I have never sewed on a Bernina before, always wanted one. The 750 or 830 sounds interesting. What I would like is more time to do projects. Also more thread and stablizer. I love making the free standing lace. I would love a collection of embroidery threads to go with my new Bernina. I would like a new Bernina! I would like tools, tools, tools – a bobbin winder, bias tape maker, good iron. Also tons of fabric. I am addicted to fabric!! I would like a new Bernina 780 and the Design Works software. I would love an embroidery machine. Hmmm What would I like for in my sewing room? Well first to finish the sewing room. But I would love a Bernina 8 series embroidery machine, new software, the cutwork tool, and a full slection of isacord thread. 🙂 But since we just had a new baby, (that make 5 children now), I will be happy with getting the sewing room finished. I can’t wait til I have my own room to work in. But then again my older 3 like to sew also. Good luck every one!!! The eyelet and circle attachments for my Bernina would be a great present! 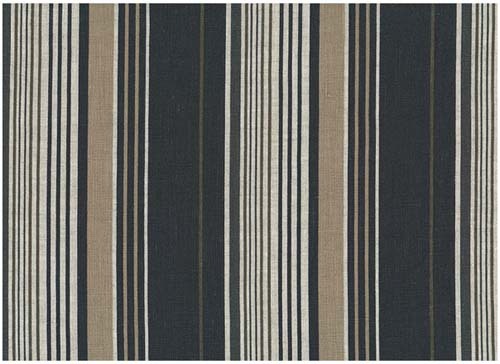 oh, and some Kaffe Fasset fabric! I would love to get a new Bernina, fabric and a sewing table/work area!! I need some new scissors. I would like an organized and freshly painted sewing room. And, of course, I would always appreciate new gadgets and fabric. After 30 years of faithful service, my 830 is showing its age. So a new Bernina tops my list and more storage, because more fabric is always on my list! I would love to have the BSR to go along with my newly purchased 640! i would like a new cutting mat, new fray check, and a new pair of sissors. i would like a new cutting mat, new fray check, and a new pair of scissors. A Bernina 750 would look great under the tree. The new Designworks if Santa can’t get the 750. What I really need is MORE TIME to do the thing I love to do….. SEW!!! Help me Santa! I recently purchased a 780E, it has not came in yet, so I am waiting. But I would wish for some accessories to go with it. I am very excited to get the machine and work with it. #1 on my list is more time. After that I would like a mentor to help me clean up my applique technique! On my “sewing wishlist” is an actual sewing room! I have taken over my dining room. I just started sewing again after 30+ years (thanks to Mimi G) and I am enjoying every minute of it. A new Bernina machine ~any version would be great~as I am struggling with an older machine-but it works! I’m not complaining! What I really want for Christmas is more time to sew :)!! That being said, I could use more Isacord thread and stabelizers! I’d like someone to clean and organize my sewing room! My wish list includes a new pair of the best fabric scissors. 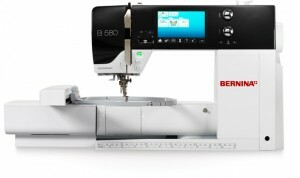 Though I own & use two Bernina sewing machines, I would love to own the B580 that includes both sewing & embroidery. I would be delighted to win the surprise bag giveaway from Bernina . . . always fun to win. I would like an 830 and Crystalworks – for figure skating dresses. I’d love to have the cabinet for my new 830. I am loving this machine. I would like a large ironing board and a new Bernina 700 series machine. My Bernina 2000DE is 20 years old now. While it still sews beautifully, I would really love a new one. Maybe the 700D. If I’m gonna wish, I’m gonna wish with all my might! I would love a cutting and craft table with the perfect ergonomically correct chair! I wish my sister would get a new Bernina and we could take classes/lessons together. Something I’m more likely to be able to get is lots more fabric so I will have plenty to work if the Air Force assigns my husband to some far away place next year. Merry Christmas to everyone! I would love to have a new Bernina. I went to the demo by one of the Bernina instructors and it was great. In my dream world, I would love to have a Bernina Educator come to my home and spend some time teaching me some “super tips” that he/she has learned over the years…. Think about that! Wow!! I need a new machine, my old Bernina 1031 was over 20 years old when I sold it. I would love a new Bernina. Would love to get more presser feet for my 1031…! That 750QE looks delicious too! My wish list for my Bernina sewing experience is very very long but the thing I would wish for most of all is a Bernina dealership close by so that I can get my machine serviced properly and have access to the accessories that I want to have. That would be a dream come true! What I would like most if more personal time to play with all the sewing toys I have. Otherwise, I think it would be fun to play with the attachment that cuts fabric! My wish is to find the energy to complete the many projects that reside in various stages throughout my sewing area. From tops that need to be assembled to just patterns and ideas, there are too many projects that I want to get done. If only there were a way to find more hours in each day! I would love time to spend at my machine and at classes… Of course, more stash and tools is always on the wish list. I love my Bernina 1130, but would love a new embroidery machine. I have a Double Cord Foot on my wish list for my 440QE. An upgraded machine would be nice for the new embroidery software available, but I love my current machine. I would love to get my daughter a gathering foot for her Bernina 830 and so many other nifty feet, but I would really love to buy her the long arm machine that she loves. On my Christmas list this year is the Bernina Embroidery Software. Got the basics out of the way and I’m ready to spread my wings in new directions. I would like to have my first Bernina – a basic machine with a variety of stitches and one step button-hole. I would love for Santa to bring me a new cutting/craft table! I would love a new cabinet for my 830 le, and a new chair with great back support! My sewing room is my safe haven and anything I can add to it makes me happy. I’d like more Isacord thread & a new Kai embroidery scissors. Merry Christmas! There really isn’t anything i NEED right now except backing for a few quilts. but like i always tell my friends….NEED has nothing to do with it!!!!! i would like to have my sewing room organization to be DONE!!!! it is a long slow process, but i am finally feeling like there might be an end!! I would like a really good fabric store within an hour’s drive. Used to have two but both owners retired. 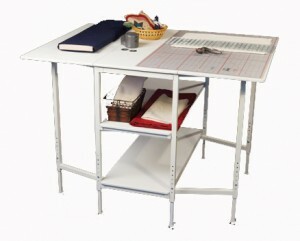 I would love a compact sewing table, kinda portable to move easily. Space is always an issue. I would love to have a new cabinet or a new cutting table. I wish all of you at We Sew All a happy holiday season.